The highest point on the road from Tatham Fells to Slaidburn is known as “Cross of Greet” or “Top of t’Cross”. There is no cross, just a large boulder with a shallow square hole in its top. 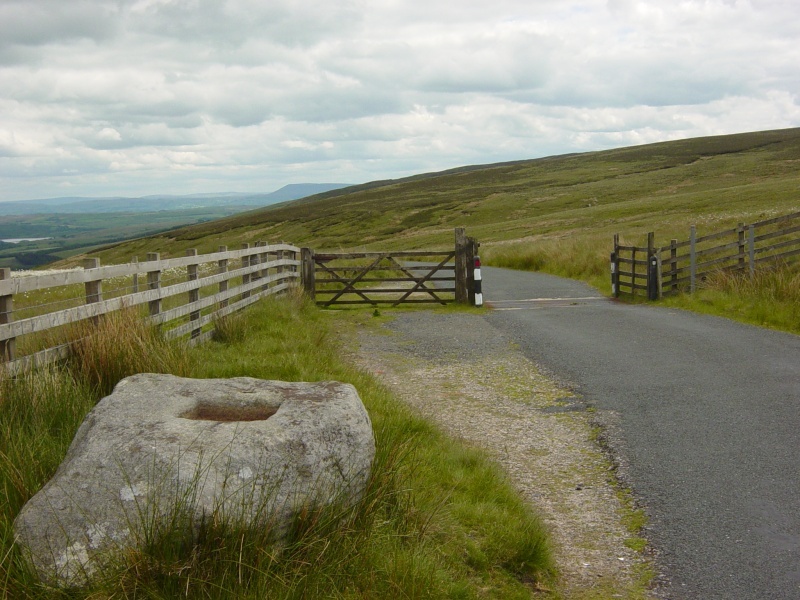 It stands on the Lune-Ribble watershed, and marked the county boundary with Yorkshire’s West Riding until 1974, when the Slaidburn area became part of Lancashire. This view shows Stocks reservoir and Pendle Hill in the distance. What of the name “Greet”? Old maps, such as Saxton’s of 1577, spell it “Grete”. Grete was (and still is) a common name amongst Scandinavian women, so perhaps there is some Viking connection. Another possibility comes from an outcrop of rock called “White Greet”, above the road, a mile to the south-east. “Greet” in this case is probably a corruption of “Grit”, referring to the rocky hillside which is a prominent and attractive feature of the pass when approaching from the south.